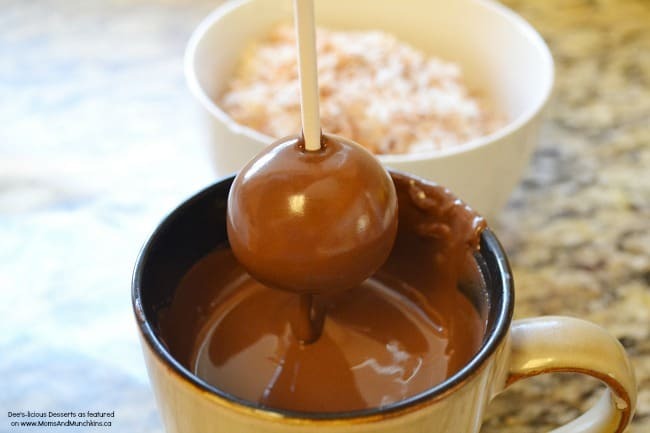 This German Chocolate Cake Pops post is courtesy of our contributor Deanna…When I was taking orders for cake pops, people always wanted them decorated a certain way, or wanted them to look exactly like a character. Rarely did people place orders for the taste of cake pops. I really take pride in making my desserts taste just as yummy as they look. I eventually talked my customers into buying a 5 flavor sampler of plain looking cake pops that were packing huge flavor. One of those flavors, German Chocolate, was a personal favorite and eventually became one of my most requested flavors. 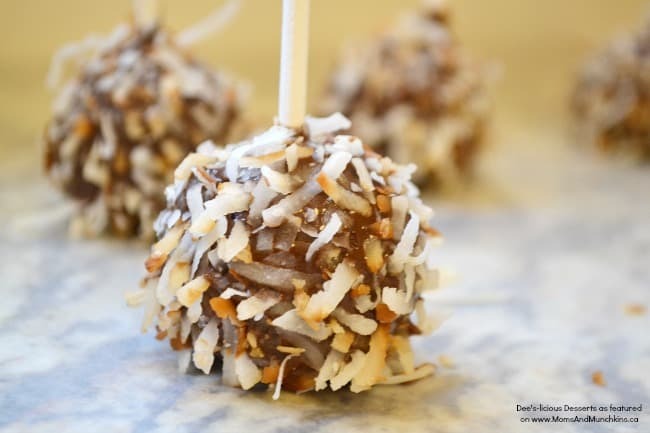 So I thought I would do something a little different for you and do a tutorial on how to re-create these tasty German Chocolate Cake Pops. One box of German Cake mix and all the ingredients, or if you’re feeling real adventurous you can bake one from scratch. This one is the recipe I use. One can of Coconut Pecan frosting (the cake recipe also has a recipe to make this frosting, but I actually prefer the taste of the store bought…GASP!..I know, don’t tell anyone). I don’t actually have photos of my process making and baking the cake because it’s already well over 100°F during the day so I baked the cake at about 10pm the night before. Also, I should mention that this can be done with your leftover German Chocolate Cake. I know this is going to sound crazy, but if you’re baking an entire cake for cake pops make it dry. Yes, bake a DRY cake. That way you can use more of the yummy pecan frosting in the cake pop dough! The first thing I do is toast the coconut. 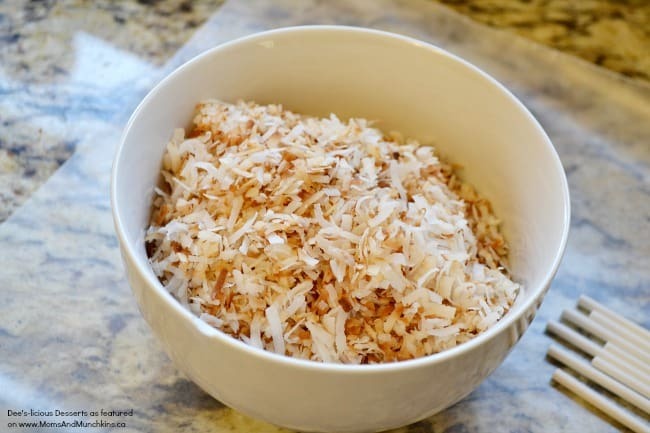 I find that it’s easiest to toss the coconut in a pan on low heat. Stir constantly, it’ll take a few minutes. 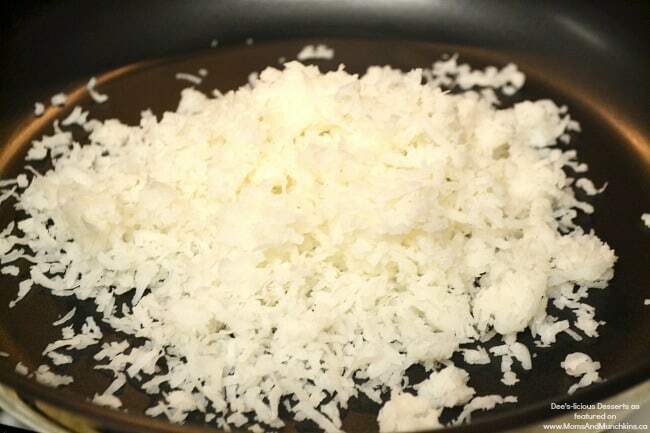 Once your coconut is lightly toasted set it aside. You can also toast coconut in the oven, I used to do that until my brilliant mother told me I could do it on the stove top – thanks Mom! Toss your cake in a bowl and break it up with a fork. Add a couple spoons full of your frosting and stir well. The down fall of this cake pop is that you really need to use a lot of the frosting to get then entire German Chocolate Cake experience. If you own a stand mixer it’s way easier to toss the cake and frosting in there and let it go for a few minutes. If you do not have a stand mixer, that’s fine too. You really want to mix this up well. Normal cake pop dough isn’t super sticky, but you’re going to want this cake pop dough a little on the sticky side. After you’re satisfied with your cake pop dough, wrap it up and let it chill for about 10 minutes. While you’re waiting for the dough to chill, melt your milk chocolate and get some wax paper out. These cake pops will be stick up. When your dough is chilled, roll it into balls. They’re not going to be perfect because of the texture of the frosting and the cake. Don’t work too hard on getting them to look round, you’re going to cover them in toasted coconut and no one will notice if it’s a bit lumpy. 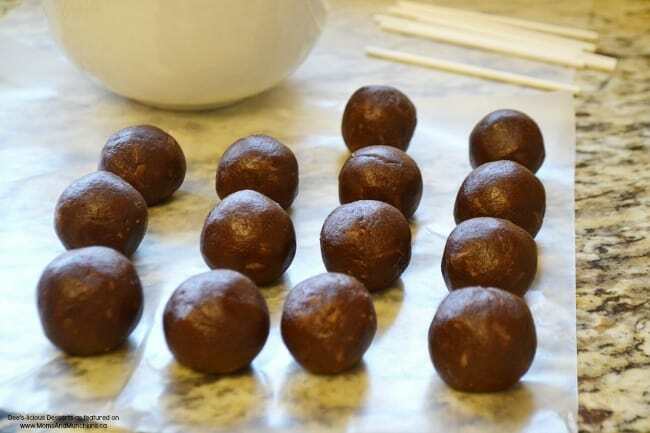 Dip the ends of your cake pop sticks in chocolate and place them directly into the cake balls, then let them chill again until you’re ready to dip. 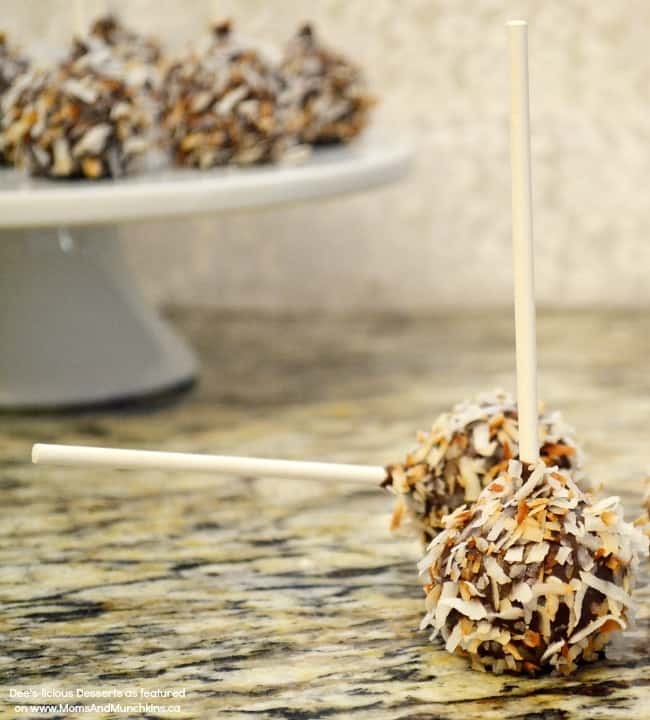 Because we had to put a little extra frosting in the dough, it’s easiest to dip these cake pops when they are chilled. I often find myself returning them to the freezer for a few minutes after dipping about 5 or so, just so they are firm enough to stay on the stick. 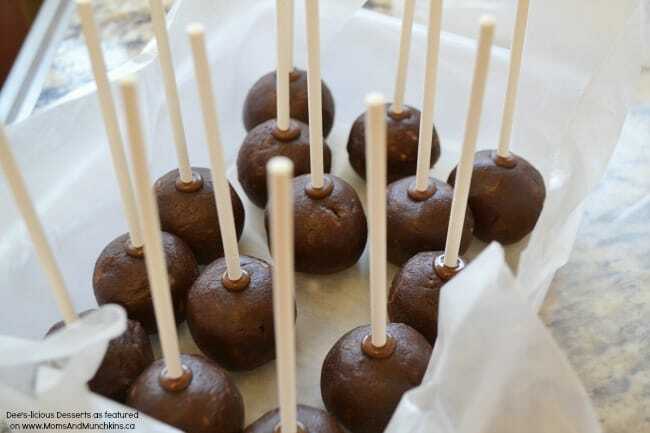 Dip your cake pops in the chocolate and very gently tap off the excess chocolate. 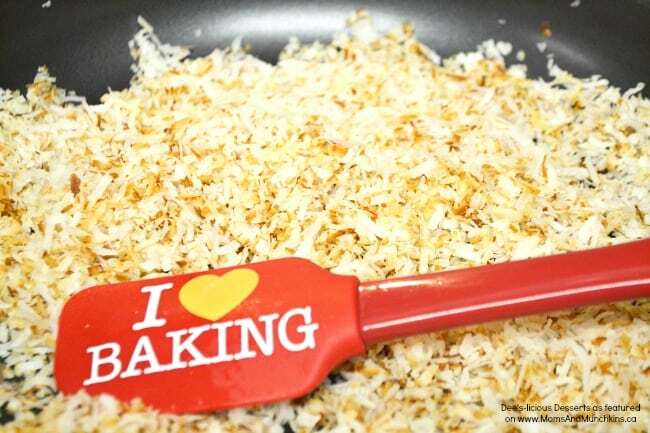 Then while the chocolate is still wet, sprinkle the toasted coconut all over. Place the cake pop directly on the wax paper. That’s it! 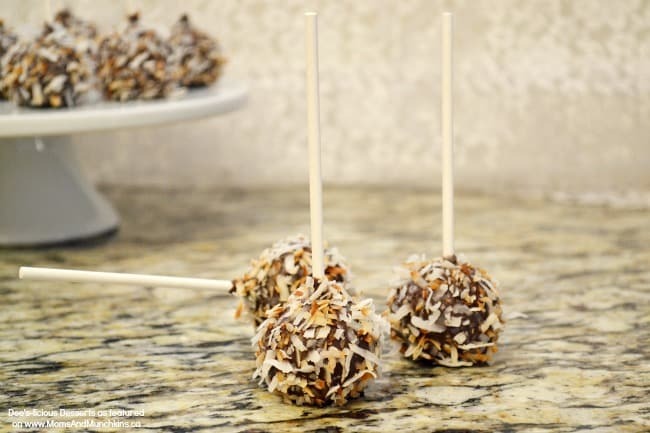 These cake pops are so delicious – your friends and family will beg for more! 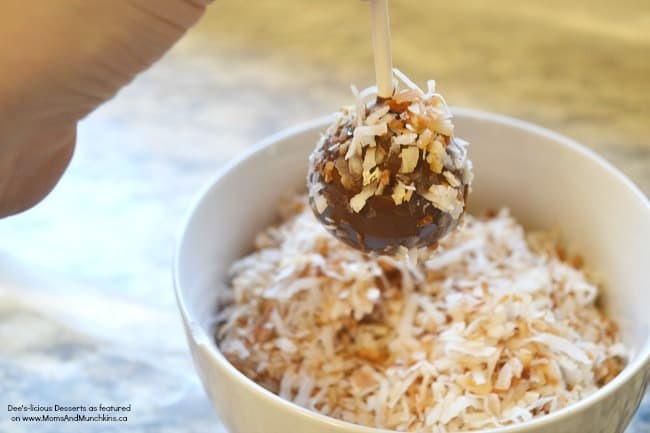 Cake pops can be stored in an air tight container in the freezer for a few weeks, so if you decide they’re too good to share, or you want to hide them from little hands, stick them in the freezer for weeks of German Chocolate Cake Pop heaven. We’d like to send a big THANK YOU to Deanna for sharing this tasty tutorial with us. For more adorable & delicious creations, follow Deanna’s Facebook page Dee’s-licious Desserts. 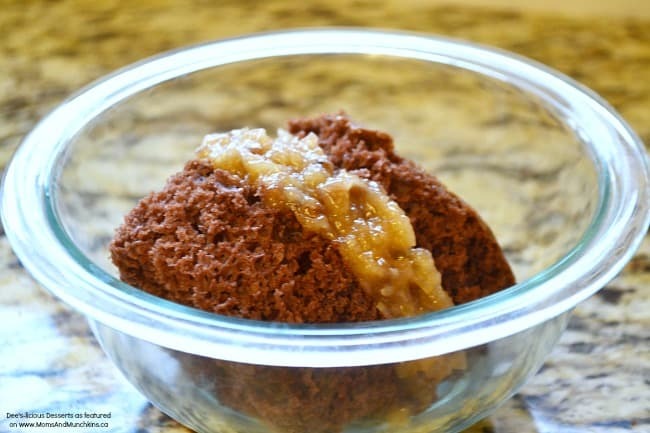 My husband loves German chocolate cake, but he eats to much. 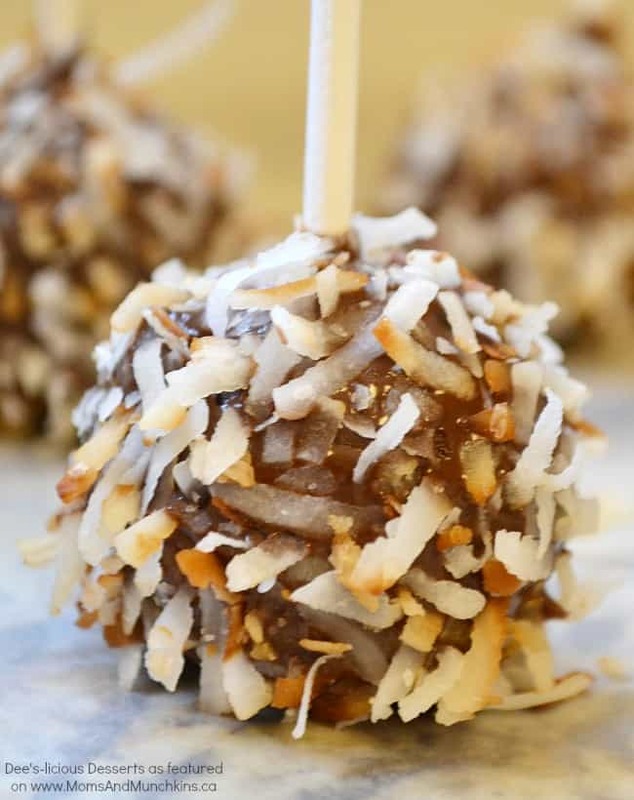 This is perfect and I’m going to make these for the Fourth of July but change to white chocolate and food color the coconut red ,white,blue. This will totally surprise him. I hope you enjoyed them! Sounds like a fun party treat for today’s celebrations. 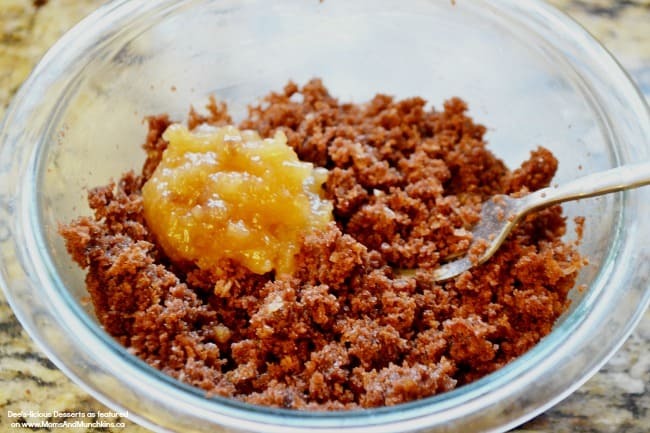 Hi, this sounds delicious, would love to make this however can I ask what brand of store bought coconut pecan frosting you buy and what store you buy from, I can’t see, to find it.